Did you set a New Year’s Resolution to become healthier? How are you doing on that goal? Now that we are in the middle of January, those resolutions might be starting to fade away. If you find yourself less than motivated, fear not. 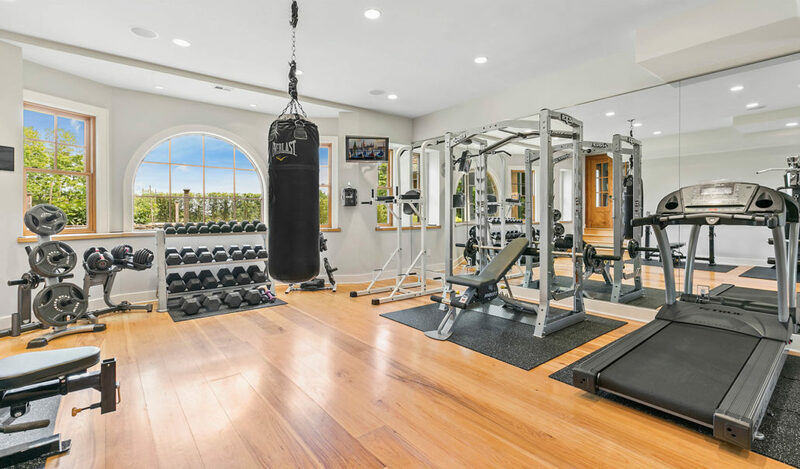 Today we visit some properties with fabulous home gyms to help you keep your New Year’s Resolutions going well into 2019 and beyond. 3 Read Court – Rye, N.Y. This home appropriately resides on Read Court, a highly desirable cul-de-sac in a prime location. Built in 2017 by accomplished Westchester/Greenwich builder Kenneth Lawrence, the house has been exquisitely crafted to the highest standards. 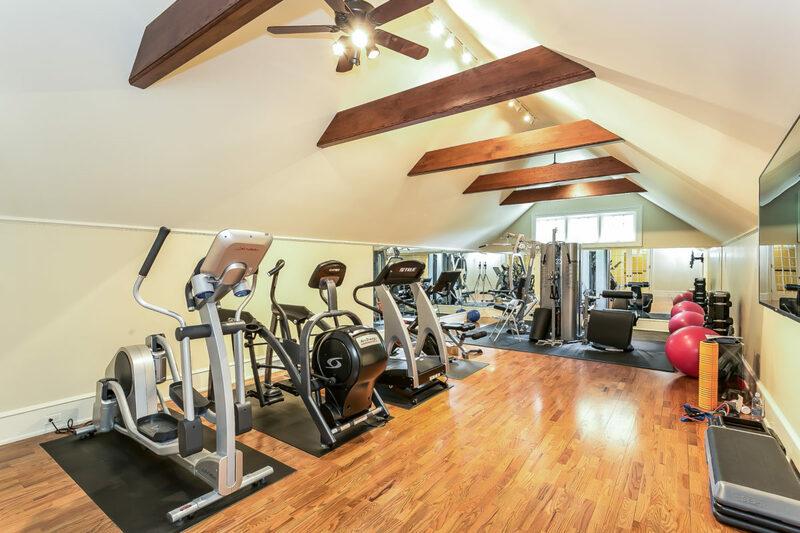 If your fitness goals include playing a pickup game of basketball with friends or family, then you are in luck, as this home includes an indoor basketball court. 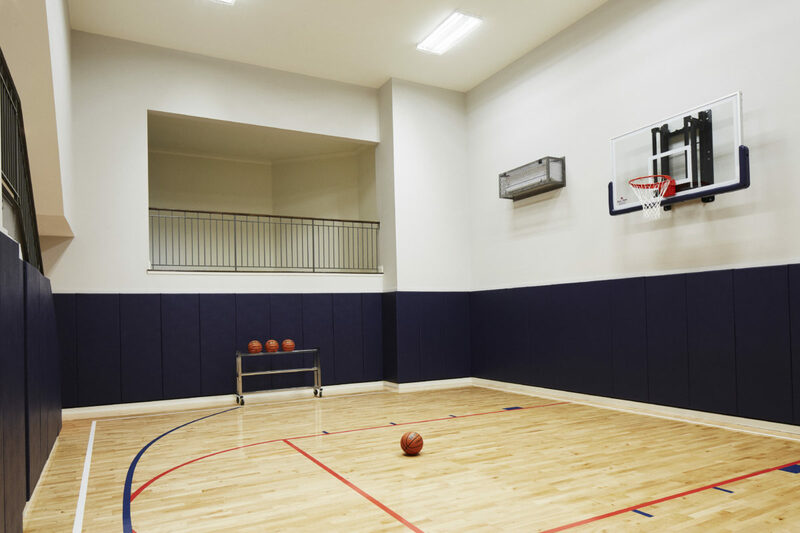 After a friendly game of hoops, relax in light-filled rooms that feature high ceilings and top of the line finishes. If you’re looking to add some extra steps to your daily routine, this property is also conveniently located close to downtown Rye and the Metro North station. 172 North Cedar Road – Fairfield, Conn. Elegant and tastefully renovated, this Colonial resides on a beautifully landscaped property in a quiet and highly coveted cul-de-sac. 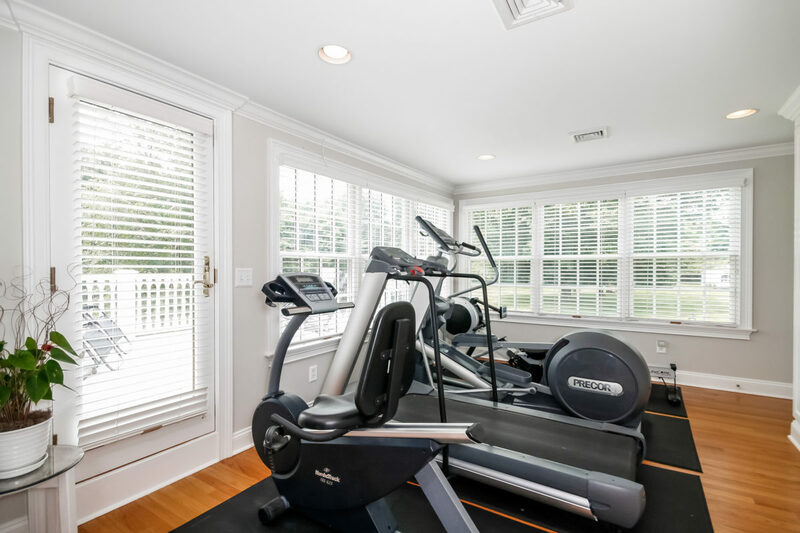 Off of the spacious deck is a wonderful workout room with plenty of space for cardio equipment or a set of weights. There’s also a fully equipped chef’s kitchen for you to prepare healthy and nutritious meals after getting your workout in. Highlights include two dishwashers, two islands, granite countertops and a mahogany breakfast bar that opens into the family room. 16 Cerf Lane – Mount Kisco, N.Y.
Just one hour from New York City is this stunning Colonial with grand spaces that are perfectly balanced by warm and intimate rooms. The upstairs of the home features six bedrooms, including the spacious master suite. 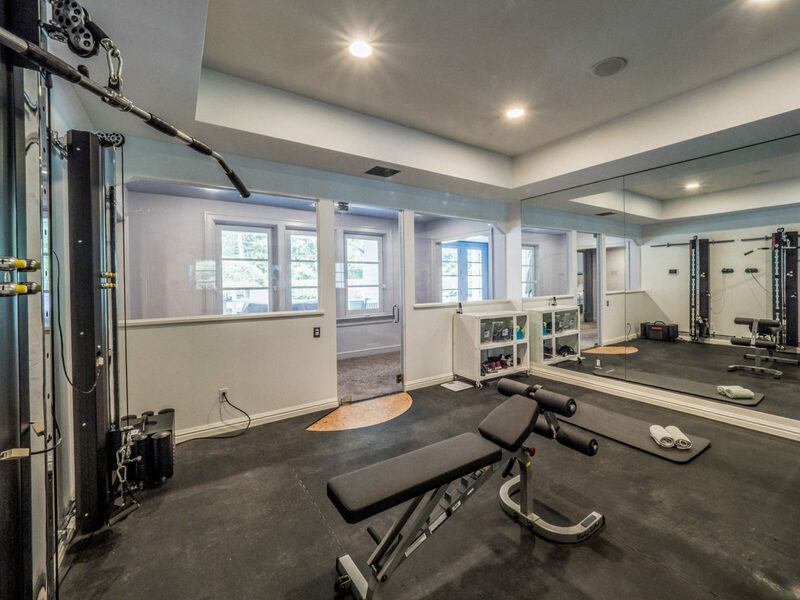 Down the hallway from the master suite you’ll find this exceptional gym/workout room, as well as an office area. On the main floor, there’s a double height library that sits quietly at one end of the house with beautiful views of the property. Other highlights include an 18-seat theater equipped with stadium seating, and a wine room that holds more than 1,000 bottles, which is perfect to toast your fitness and health goals. 1227 Pequot Avenue, Fairfield, Conn.
With a sensational Southport location directly on Long Island Sound, this spectacular 1.37 acre waterfront estate is graced with a 200 foot wide private sandy beach and a stunning heated in-ground pool and spa with a terrace. While retaining circa 1908 architectural elements, this 9,730 square foot American shingle-style house has been sensitively and beautifully expanded to include nine bedrooms, eight and a half baths and seven fireplaces. 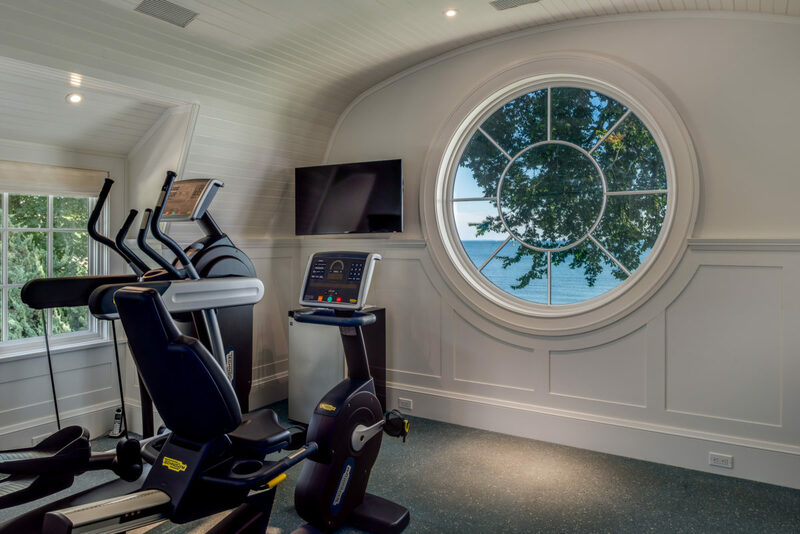 You’ll absolutely adore the stunning water views from the home’s workout room as you burn off those extra calories. 6 Cob Drive – Westport, Conn. Completely renovated in 2008, this home is unique in design, displaying sophistication like no other. The main level has a spectacular entry hall ending at a delightful sitting area. There’s a superb formal dining room and living room with an updated study/home office off of the living room. The upper level includes a beautiful master bedroom with fireplace and his and hers baths, plus four additional bedrooms and bathrooms. The lower level is beautifully finished with an exercise room and a contemporary wine cellar with storage for 1,432 bottles. This wine cellar also opens up to the pool and patio, making for great outdoor wine tastings or entertaining.